With a sharp and pointed angle at one end for cutting, slicing, scraping, and trimming the bottom of pots while they are on the potter’s wheel, the Foot Shaper is an essential clay tool for ceramic artists. 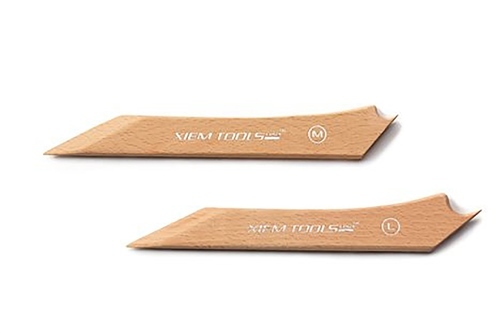 The opposite end of the Foot Shaper tool has a smooth concave edge to effortless create a consistent foot on all pieces. Manufactured from the finest quality of imported beechwood, the Foot Shaper is handcrafted by well-trained artisans to ensure the highest quality. The Foot Shaper is available at this time in medium and large and the length is 23 cm or 8.5 inches. A very adaptable and well designed tool.